Valerie Bothell: Leopard Skirt - 6 Different Ways! With the change in the weather, I have felt a change in myself! I have been a crazy quilter for 22 years and have loved every minute of it. Through my crazy quilt journeys, I have met many amazing people and have a lot of fun stories go along with my experiences. Along the way, I had the opportunity to write two books. That was a dream come true for me! For a year or so, I have felt myself drawn to a new topic. Not new to me, but new to my blog. I have always loved fashion and clothing. 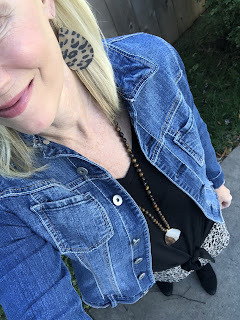 It seems to me that crazy quilting and fashion have many things in common and it would be no surprise to anyone who knows me that I love both! They both involve creativity, color and fabrics to name a few of the similarities. 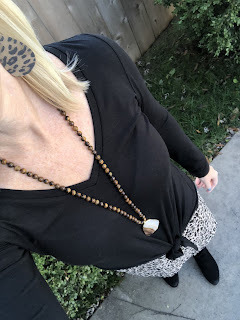 As I have thought about my options over the last year, I have decided to incorporate some fashion into my blog. Does that mean that I am done being a crazy quilter or finished writing books? Absolutely not! I may still have a few books in me in the next few years, but I would like to explore some other things I love. 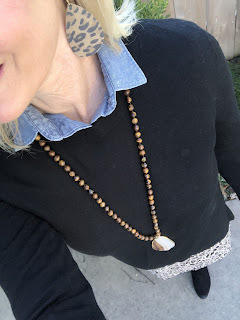 So I guess what I am saying is, you may see both of my creative loves on the blog: fashion and needlework and we will see where it goes from there! The other day, I was shopping at the Loft and I found this great leopard skirt. 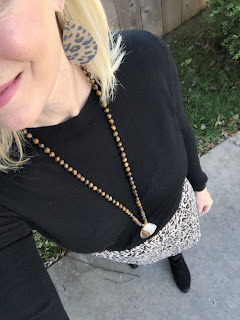 I have wanted a leopard skirt for a long time but just never found one I loved. Well I found it and quickly scooped it up! I wore it to church Sunday and then I decided that I would try to make as many outfits with it from things that I had in my closet. The items I used, are pictured above: my leopard skirt that I love, a basic black sweater, a basic black tee that has been updated with a tie front, both a denim shirt as well as a denim jacket. Last but not least is my favorite black booties, a new necklace from Accessory Concierge and leopard earrings. 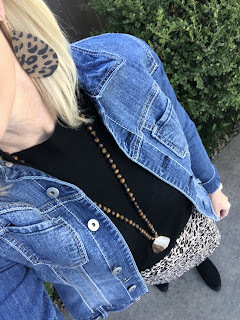 First I tried the leopard skirt on with a denim shirt and I loved it, so I changed into my basic black sweater and tucked it in. Both were a winner as far as I was concerned! I then tried layering the basic black sweater with my denim shirt for those colder days this winter. Then I switched it up and paired the denim jacket with the basic black sweater. I felt like I had scored with the first 4 outfits! 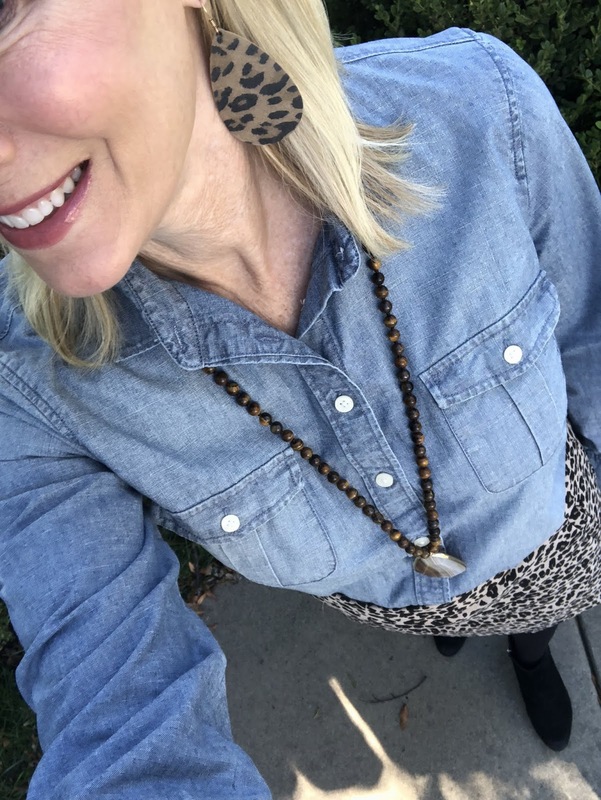 I tried the front tie tee with it and then for colder days, I paired it with the denim jacket, for two more outfit choices! If you will notice, in all the outfits I used the same accessories and they worked in every one of them. 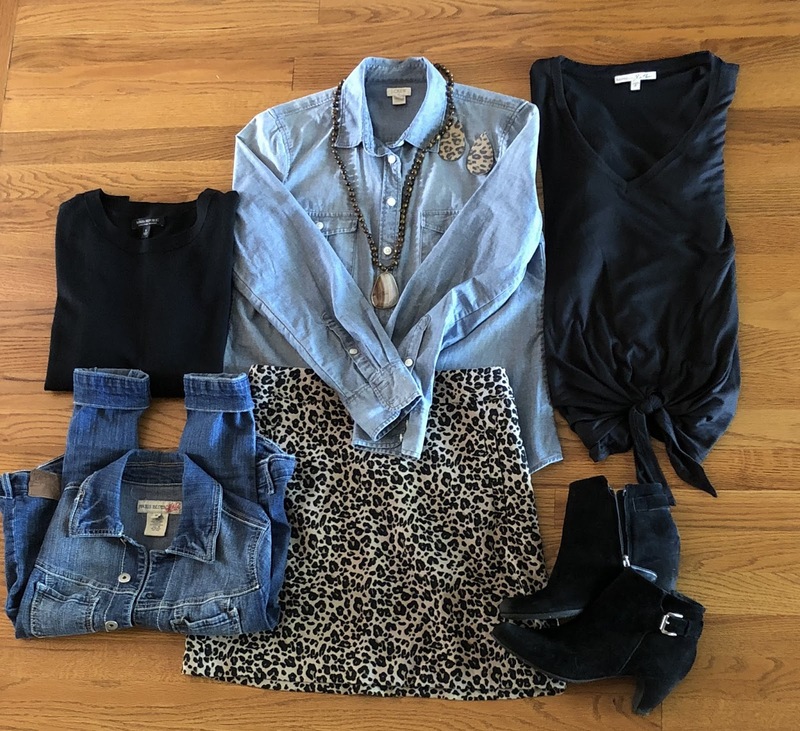 Links to help with your outfits! Talk to you soon with more fun outfits!